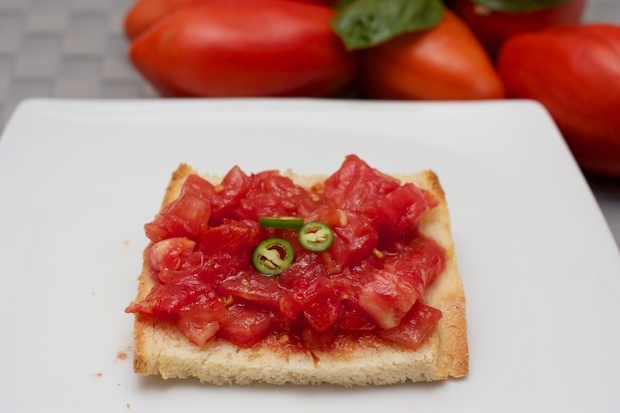 A fresh and tasty tomato bruschetta is a good antidote to the summer heat. This simple preparation requires that the ingredients are of high quality. In recent times it had become fashionable to prepare this dish using cherry (pachino) tomatoes because they easy to prepare since you don’t need to peel them. You simply cut them in half to divide them into four parts and the task is done. We’ve cultivated Costoluto tomatoes for the past few years and this particular variety has many folds as if the tomato has protruding ribs. It is a very pulpy tomato that has few seeds and a sweet and gentle flavor and is my absolute favorite. The preparation described here uses this variety that you can also find commercially. In this photo you see at the center of bruschetta little pieces of jalapenos, the green Mexican hot pepper. This chili is a passion of my daughter-in-law Colleen and so when I found a seedling in a nursery near my home, I thought of trying to grow it. We have already collected many hot peppers from the plant and have found them fantastic. Since I don’t love spicy things, that I tried to pair it with bruschetta and I must say that the approach and was very positive. This green pepper produces a spicy chili but the taste is more herbaceous than red chili peppers. Two beautiful bruschetta with tomato can safely replace a pot of pasta during the summer season. If you have guests you can keep the tomatoes in a bowl and cut the slices of bread into small pieces and let everyone serve themselves. Wash the tomatoes and peel them with a small sharp knife, without blanching them. Cut into very small cubes. Pour into a salad bowl, add the chopped garlic and washed basil, dried and torn by hand. Add the jalapeno. Allow to marinate for at least an hour. Toast the pieces of bread for a few minutes. Before serving the tomato on the bread slices add some salt and olive oil to the bruchetta. Mix thoroughly. (I suggest you put the oil and salt in at the end to prevent the salt from watering down the tomatoes, including the olive oil.) Serve immediately to prevent the bread from losing its crispiness.